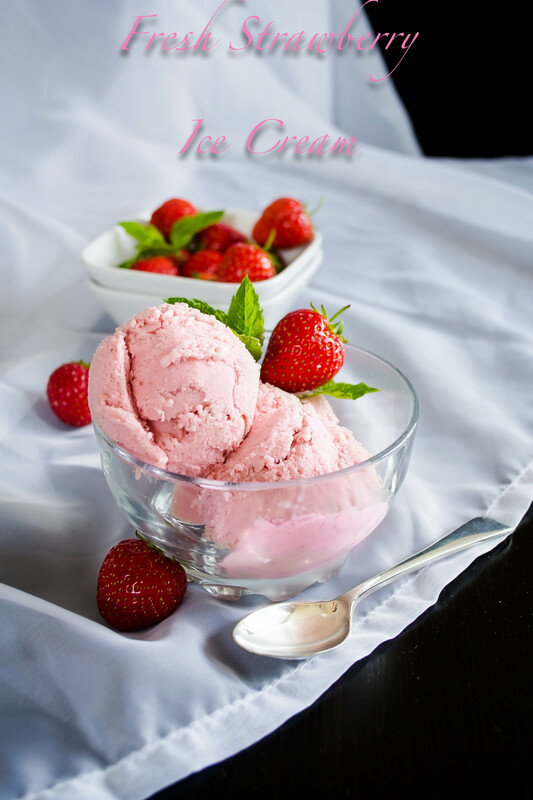 Fresh Strawberry Ice Cream is a delicious, smooth, super rich and creamy ice cream full of strawberry goodness. Perfect for a hot Summer day..
Its Summer. Season of sweet luscious strawberries. Best time to enjoy this wonderful ice cream. I love strawberry, so any thing with strawberry is a “yes” for me. You know as a kid I was not at all fond of strawberry ice cream, and always favoured chocolate, vanilla or butterscotch over strawberry ice cream. One more reason to make this ice-cream is because hubby desired to eat tutti-frutti sundae ice-cream. It essentially is a combination of vanilla and strawberry ice-cream with fresh fruits and loads of nuts. Its just yum… I will be uploading the recipe soon. That is why instead of buying a store bought ice-cream I decided to make my own. 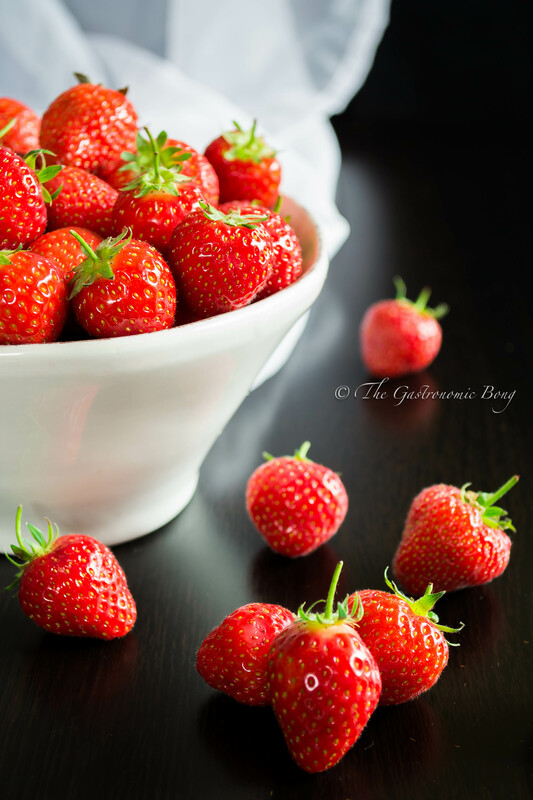 It is delicious, soft and smooth and so creamy with a subtle strawberry flavour. Just gorgeous. I licked my bowl clean, trust me its so delicious. And very easy to make. You can make it even if you don’t have an ice cream maker. 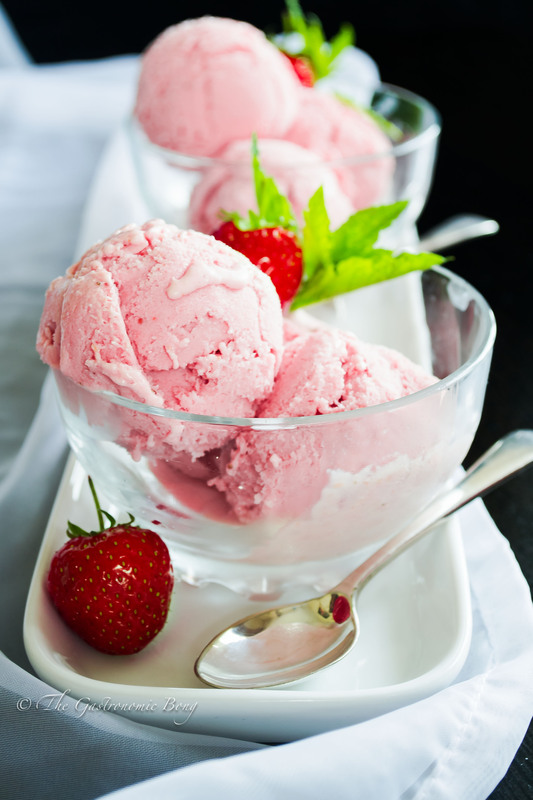 A delicious creamy and rich Fresh Strawberry Ice cream.. In a large bowl, whisk together the egg yolks and 3/4 cup of sugar for 4-5 minutes or until it turns a pale colour and thickens in consistency. Pour 1 cup of the hot milk-cream mixture into the egg-sugar mixture to temper the eggs while whisking continuously, slowly pour the egg-sugar mixture back into the saucepan with the milk-cream mixture and stir the it constantly over low heat about 5-7 minutes, scraping the bottom as you stir, until the mixture thickens and coats the back of a wooden spoon. Strain the mixture through a fine sieve in a clean bowl, add the vanilla and salt, stir to combine and chill for 1-2 hours. Remove the custard and the strawberry puree from the refrigerator. Add the strawberry puree to the custard and stir to combine fully. Now cover and place the mixture in the refrigerator again for at least 8 hours (or overnight). Once the mixture is sufficiently chilled, give everything a good whisk to combine it, place it in your ice cream machine and freeze according to the ice-cream makers instructions. Prepare the custard base as directed in the recipe. Remove custard from the refrigerator and stir. Now pour the mixture to a deep freezer-safe container and place in the freezer for 45 minutes. As it starts to freeze near the edges, remove from the freezer and stir vigorously with a whisk, being sure to break up any frozen sections. Return it to the freezer. Continue to check every 30 minutes, stirring vigorously as it’s freezing. This might take 3-4 hours for the ice cream to be sufficiently frozen and ready. 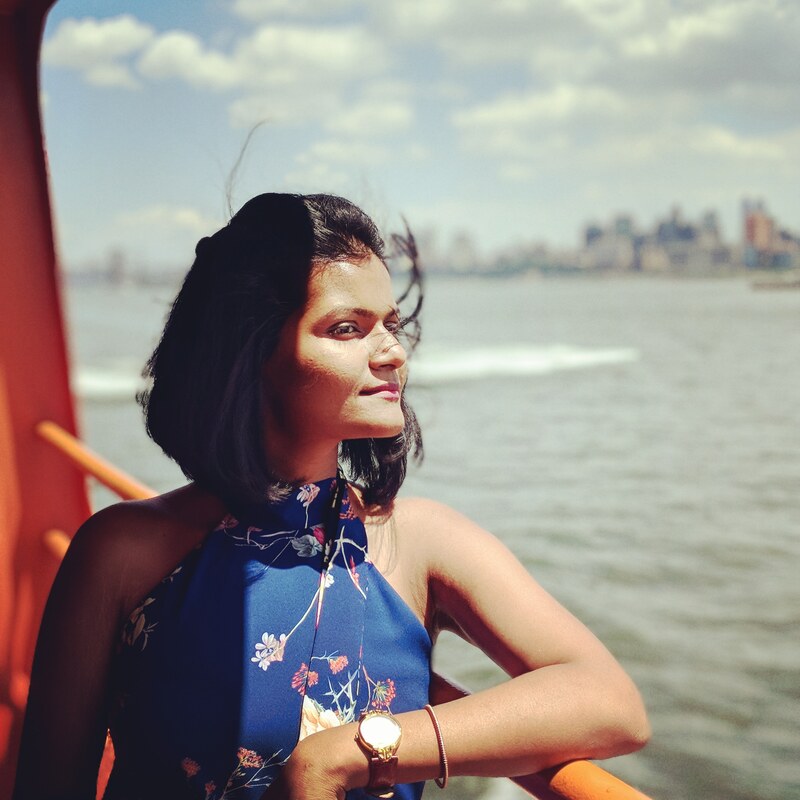 Arpita, I’m so so so glad you also included the directions for how to make this amazing ice cream without a machine! I always get so disappointed when I find an ice cream recipe I like but it calls for an ice cream machine. Your photos are beautiful by the way! Hey Alyssa, Thank u so much. glad you like the photos. 🙂 I can totally relate as earlier I also didn’t have an ice cream maker and I had to look for ice cream recipes which did not include the use of it.. 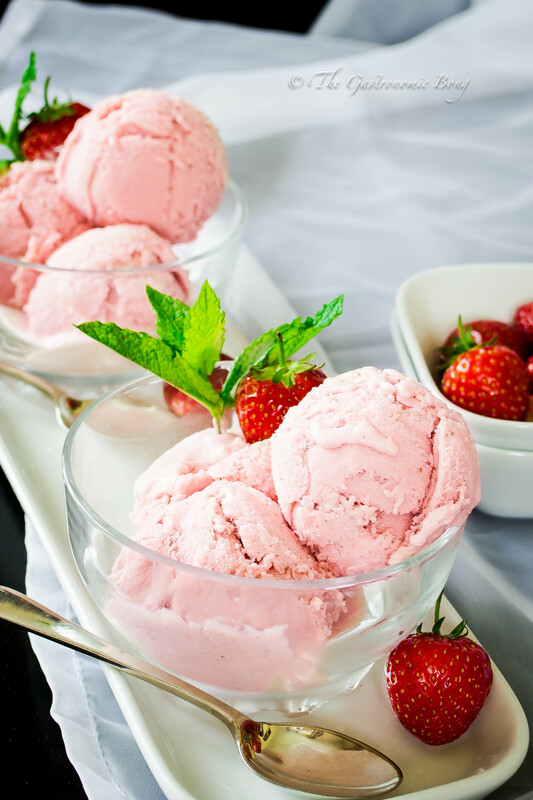 Strawberry ice cream is one of my favorites! I always love eating it with sprinkles on top 😛 Yours is so creamy-looking and gorgeous! The light pink hue is so pretty! Wow.. thanks a lot Arpita for this wonderful recipe.. i tried this recipe yesterday and it was amazingg.. thanks a lot for the detailed recipe.. keep it coming..
Oh this looks fantastic! Strawberry ice cream is my fave! I can’t wait to try it! I completely agree with you! 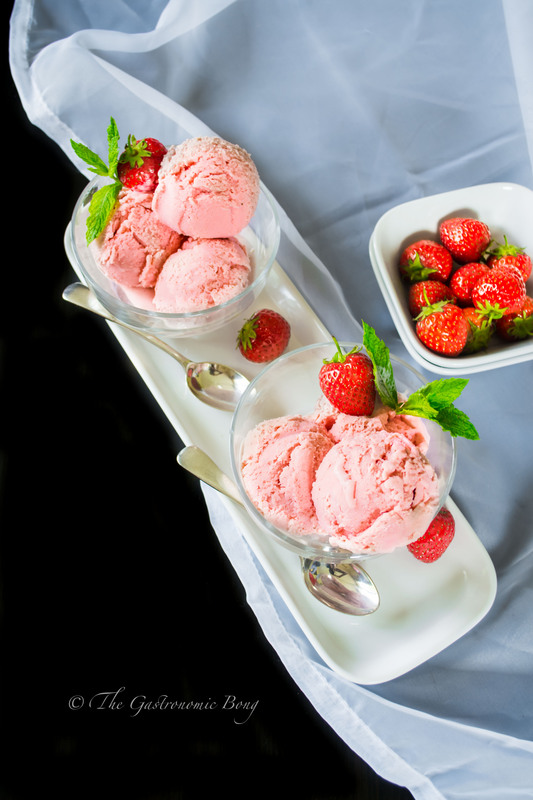 The store – bought strawberry ice creams taste so synthetic and artificial! This homemade version is just the best! the best part is that it does not need an ice cream maker so I can totally make these when strawberries are available this winter! Yum!